Introducing the latest Mercurial Vapor VI FG featuring Nike's signature Metallic Mach Purple/Black/Total Orange colorway for the 2010 World Cup Finals in South Africa these boots will be showcased by some of the planet's fastest players! The latest in a long line of performance speed boots, this sixth generation brings smarter football to your game. A glass fibre chassis brings you closer to the new enhanced traction elements. With direct injected studs, a new Vapor Traction plate and concentrated forefoot zonal spikes the Vapor VI gives you the extra burst of speed and gives you the advantage over the opposition. Soft, supple Teijin synthetic upper is engineered to conform to your foot's shapre for ultimate comfort. The upper is enhanced with specifically placed ball-control coating on the forefoot, to aid control of the ball at top speed. The Vapor VI benefits from a stretch-synthetic leather lace cover to increase ball contact area for improved accuracy and touch, whilst an internal heel counter helps lock down the foot for a snug, secure fit. Tipping the scales at 230g (US size 9), the Mercurial Vapor VI will bring you up to pace with the modern game. 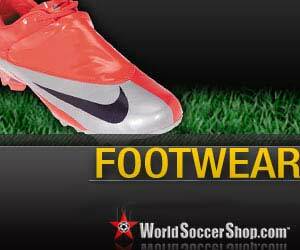 Design input and feedback from players across the globe ( including Cristiano Ronaldo and Didier Drogba ) have allowed Nike to create the ultimate pro level football boot for players who know that a split second makes all the difference.